In August of 1795, Chief Tarhe of the Wyandot tribe signed the Treaty of Greenville signaling the end of the Indian wars; the Ohio country was open for safe and legal settlement. Ebenezer Zane, under government contract, cut a road in 1797 from Wheeling, WV to Maysville, Kentucky. This thoroughfare, known as Zane's trace, became an important conduit for the development of southeastern Ohio. In particular, Lancaster, OH quickly became a thriving community and the birthplace of two prominent mathematicians, B.F. Finkel and E.B. Seitz. On August 24, 1846 Enoch Beery Seitz was born in Rushcreek Township, just outside the small village of Bremen located a half-dozen miles east of Lancaster. According to his brother George, E.B. Seitz had mastered Ray's Elementary and Higher Algebra texts by the age of sixteen. Seitz began his teaching career at West Point School, just south of Bremen. By 1870, he enrolls at Ohio Wesleyan College and takes a year of general coursework. This academic experience prepared him for a professional life in education. 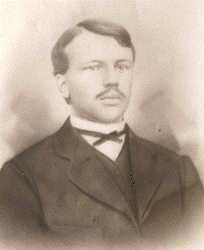 In 1872 he accepts a faculty position at Greenville High School. Evidence is scant, but the record indicates that he was an inspirational teacher. Coinciding with his Greenville appointment, Seitz began a prolific career as a mathematics problem solver (over 500 published solutions). From 1872 until 1879, he publishes solutions in the following periodicals: School Day Magazine (A. Martin), The Analyst, The Mathematical Visitor (A. Martin), Mathematical Magazine (A. Martin), The School Visitor and The Education Times of London. The result of this prodigious output was that Seitz became nationally and internationally known in the mathematical profession. "A cube is thrown into the air and a random shot fired through it; find the chance that the shot passes through the opposite side." The quantity and quality of his body of work was significant to the point that E.B. Seitz was elected to the London Mathematical Society in 1880, the 5th American so honored. In addition to his prowess as a problem solver, Seitz also enjoyed a fine reputation as a teacher while at North Missouri State Normal. One of his pupils was General John J. Pershing. Pershing wrote a testimonial letter to commemorate the dedication of a plaque to Seitz. 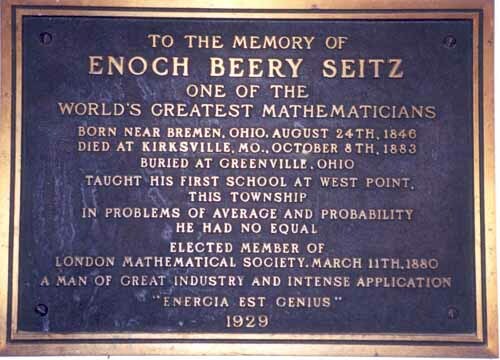 He wrote, "I remember Professor Seitz as a fine mathematician for whom all of pupils had the greatest respect. He not only had a complete knowledge of mathematical subjects, but he knew how to teach others." In 1883, Seitz began negotiating for the chair position at the University of Texas. However, in 1883, he fell ill with typhoid fever and died on October 8th of that year; he was 37 years old. He is buried in the Greenville Union Cemetery in section 14, lot 291, grave #12 together with his beloved wife Anna Kerlin Seitz. Post mortem remembrances were numerous and reflect the Guilded Age prose. Artemis Martin wrote, "A star has fallen...in the early prime of manhood, and the scientific world is called to mourn the untimely loss of one of the brightest mathematical intellects ever imprisoned in mortal clay." A lovely but incomplete biography was written by Benjamin Franklin Finkel in the first volume, first issue of the American Mathematical Monthly in January 1894. Memorial Plaque dedicated to Seitz's memory in 1929, located in the old Bremen High School. Bremen Area Historical Society Newsletter, Vol. 6, NO.8. September, 1995. Finkel, B.F. (1894). Biography: E. B. Seitz. American Mathematical Monthly, Volume 1, Issue 1 (Jan. 1894), pp. 3-6. Selby, P.O. (1963). One hundred twenty-three biographies of deceased faculty members. Northeast Missouri State Teachers College (Truman State).